Slowly sipping a delightful glass of local wine at my favourite Riviera beach cafe, engaged in some serious people-watching, my waiter abruptly races by, arms outstretched, to rescue a startled woman, perched atop her chair trying desperately to escape a renegade wave. Mission accomplished and with everyone safe, a chorus of “bravos” briefly erupts from us cafe-diehards, braving Nice’s October weather. Keeping a vigilant eye out for the next errant wave, we quickly get back to the business at hand: happy-hour gazing at the Mediterranean seascape as dusk slowly rolls in. After all, pourquoi pas? (why not?). I have no particular place to be other than right here on the pebbled beach, on the exquisite French Riviera. At least once a year, I shake things up a bit and mobilise my freelance copywriting and travel writing business. For three months at a time, I adventure abroad to mix work and play in wildly popular spots like Barcelona, Florence, Lisbon and Nice. Four years ago, I decided to enrich my work-life balance by upping the “go for the gusto” factor. As a baby boomer who’s not retiring anytime soon and whose passion is travel, I decided it was definitely time to globalise my lifestyle. If not now, then when? Working as a digital nomad has been life-changing. Being able to work from anywhere in the world results in longer travel escapades, deeper exploration and discovery, immersive cultural experiences, new friends and lifetime memories. One of my favourite homes away from home is drop-dead-gorgeous Nice, an iconic city along the world renowned French Riviera. 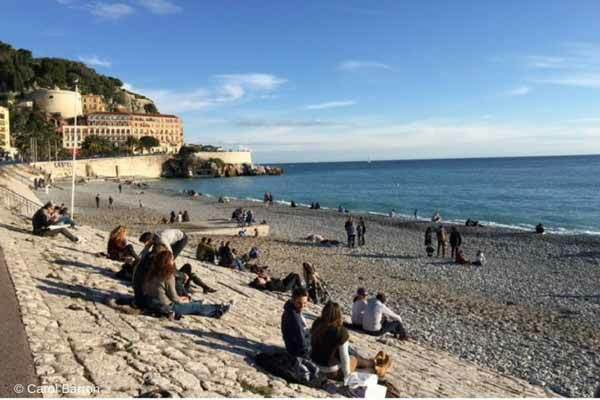 Nice proved to be the ideal spot for working just about anywhere in the city with plenty of exciting things to do and see along the sun-kissed Riviera. In the city, you can conveniently use your apartment, a favourite beach cafe, a library or a floral garden park as your office. And, when it’s time to play, you’re in one of the most beautiful spots in the world, where you can experience a world-class cultural scene, famous Mediterranean food, historic landmarks, walled hilltop cities, museums, art galleries and more. Every day I step out of my apartment building onto cobblestoned streets, I wade through countless tantalising smells wafting from neighbourhood creperies, outdoor cafes, boulangeries and pastry shops. Despite the temptation, I walk on for 10 minutes to arrive at the pedestrianised Promenade des Anglais. During my brisk, five-kilometre coastal walk, gazing at blue skies brush-stroked with wisps of white cloud and colourful mountains in the near distance, I wonder what other excitement the day holds. I usually work on my laptop until lunchtime, when the town virtually shuts down and cafes and restaurants overflow with hungry clientele. In Nice, everyone knows exactly when lunch begins, thanks to a 17th century custom of firing a canon burst at noon from the old Nice Fortress, alerting the town to stop what they’re doing…it’s lunch time. Schools, shops and businesses close for one-and-a-half to two hours, with locals scurrying home or to their favourite cafe or restaurant. 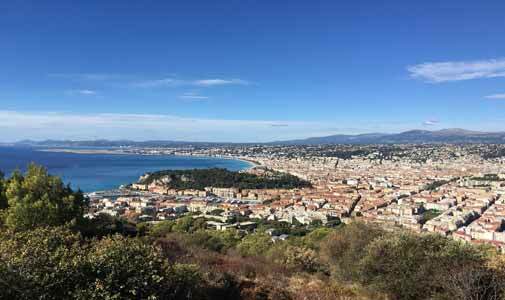 You actually feel as if Nice is giving you permission to cease work for lunch and play. The beach is the perfect spot for a lazy lunch. Grab a ham and cheese baguette or a pizza nicoise and head for the beach, lounge at a beachside cafe or browse the large, open market offering fresh local fare. Depending on where I end up that day for lunch, I can resume work there or choose to walk the picture-perfect city and sightsee for a while. Evenings are for socialising (normally at happy hour when food and drink are discount) or for staying in, cooking a small meal and maybe finishing some work. With Nice as your home base, it’s easy to explore at your own pace or day-trip to idyllic, breath-taking Riviera hot spots like Monte Carlo, Cannes, Saint-Tropez, Villefranche-sur-Mer and Antibes. By travelling in low-season; renting an apartment for months at a time (sometimes up to 50% cheaper in off-season); shopping local markets; fixing some meals at home and enjoying great happy hour prices at sunset, you can significantly lower expenses. And the proverbial icing on the cake is that your income stream doesn’t miss a beat while working in your overseas office as a digital nomad. What Does it Cost to Live in France?